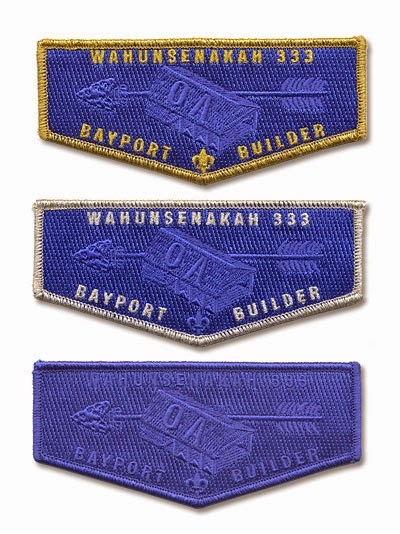 The Wahunsenakah Lodge special edition flaps to raise funds for an OA Shelter at Bayport Scout Reservation are out. The flaps were sold via preorder and are now shipping. The fundraiser flap patch is solid blue with ghosted design pictured above. There are three versions: blue border/lettering sold for $5 each, silver mylar border/lettering for $20, and a gold mylar border/lettering only available in a set of all three for $75. Wahunsenakah Lodge 333 continued their "Saluting the Military theme" for their Spring Service weekend patch. 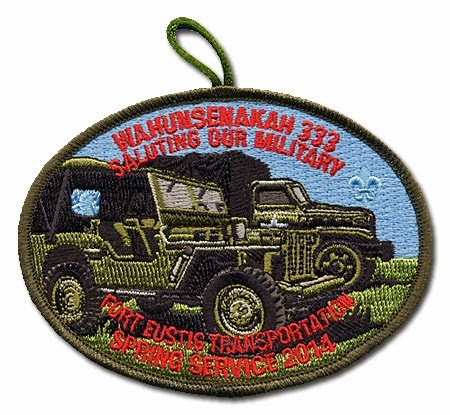 The Spring Service weekend was held May 16-18 at Bayport Scout Reservation and the oval patch issued for the event features a jeep and truck in salute to Fort Eustis Military Transportation. You can see all of the activity patches issued by Wahunsenakah Lodge since 1996 here.